Melicoccus. (From Greek meli, honey, kokkos, kernel: the fruit is very sweet.) Sapindaceae. Two species of glabrous polygamous or dioecious trees. Leaves alternate, equally pinnate, pinnae sessile, in 2-3 pairs, almost opposite. Inflorescence a many-flowered raceme or panicle; flowers regular; petals 4 or 5; stamens 8. Fruit a drupe; single seed surrounded by a large fleshy aril. Tropical America, W Indies. Z10. A tropical American relative of Litchi (find Lychee via the home page), Melicoccus bijugatus is a large spreading tree native to the tropics of Central and South America. 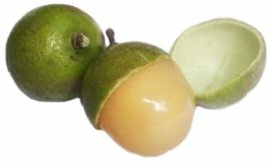 They are grown for their fruits, collected and sold only locally, which consist of a sweet and gelatinous pulp surrounding a single large seed, enclosed in a thin green rind. When ripe they have a grape-like flavour; the seeds are also eaten roasted. A decoction of the bark is used throughout its native region in the treatment of dysentery. Melicoccus thrives in tropical lowlands which receive heavy rainfall and are intolerant of frost, Key West in Florida probably representing its northern limit. In temperate regions, slow growth and small stature make it a suitable subject for the hot glasshouse, in a medium-fertility loam-based mix with additional leafmould. Propagate from seed (although fruiting is variable in seedlings) or by air layering; alternatively, from greenwood cuttings with bottom heat in a closed case, or under mist. SPANISH LIME; HONEY BERRY; MAMONCILLO; GENIPE. Slow-growing tree to 18m. Leaves to 15cm, pinnae 4-6, to 10cm, elliptic-lanceolate, glabrous. Flowers fragrant, white tinged yellow. 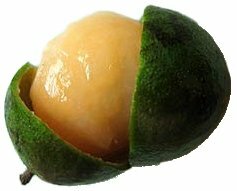 Fruit to 3cm diameter, globose, green, leathery, pulp juicy, translucent, tinged yellow.